2018 Season Review: Should the Broncos re-sign Domata Peko, Shelby Harris? The Broncos’ defensive line has taken a huge step from where it was just two years ago when they were ranked fifth-worst in run defense. This is in large part thanks to the discovery of defensive end Shelby Harris and the addition of veteran defensive tackle Domata Peko. 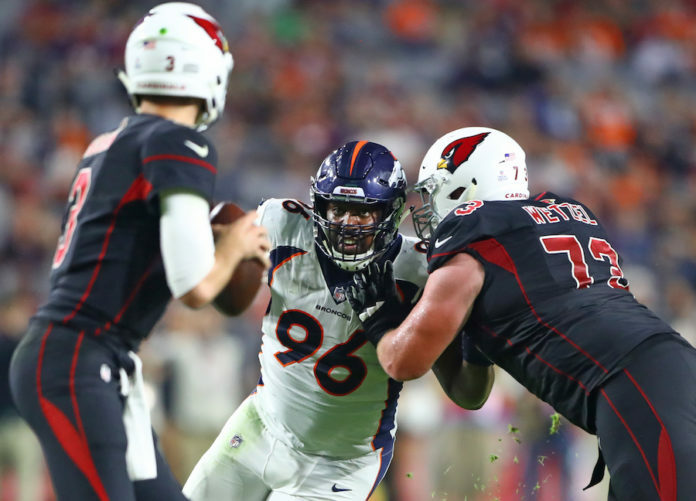 Peko has been a massive upgrade at defensive tackle, and one could even make the argument that he has done more for the Broncos in the locker room than on the field. It’s one reason why the Broncos should consider retaining him. When John Elway signed Zach Kerr, Peko, and Harris along the line to solve a putrid run defense, not much was expected, but they quickly turned the fifth-worst run defense to the fifth-best in 2017. Harris was a castaway who played in just eight games and recorded a mere 14 tackles before the Broncos signed him as an afterthought. Harris was quick to make his mark. He tallied 5.5 sacks and more than double his career number of tackles while playing in all 16 games in 2017. The defensive end then became a star on the Broncos’ defense in 2018, despite playing fewer snaps. Harris went from a Pro Football Focus grade of 64.5 in 2015, to a grade of 76.3 in 2017, before sky-rocketing to a grade of 90.8 in 2018, making him the highest graded player on the entire team (Von Miller is second with a grade of 90.5). Now, with Kerr, Peko and Harris all set to be free agents, should the Broncos consider looking for an upgrade along the defensive line, or should they try to hold on to an important leader in Peko, and a burgeoning star in Harris? The Broncos have picked the wrong year to find a quarterback, but luckily it’s a great year to be looking for a defensive tackle. Ndamukong Suh and Sheldon Richardson both have expiring contracts and aren’t likely to be re-signed, while Gerald McCoy is expected to be cut by Tampa Bay. That’s two All-Pros and a Pro Bowler on the open market at a position of need for the Broncos. 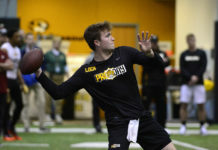 It could be a slam dunk for Denver, but if the Broncos choose to address the quarterback position or sign another high-priced free agent like C.J. Mosley, they may not have the cap space to make a move for an expensive defensive lineman. It is also debatable whether or not Suh and Richardson would be worth the headache off the field. If the Broncos miss out on a big-ticket guy like McCoy, though, it makes sense to turn their eyes toward the draft rather than sign a discount free agent, when they could likely keep Harris and Peko for a similar price. Luckily for the Broncos, the draft is absolutely loaded with defensive line talent. If the Broncos were to lose Shelby Harris they could swing for the fences in the first round with Rashan Gary. Gary didn’t have great production at Michigan, but he’s an athletic freak who many believe was incorrectly utilized. 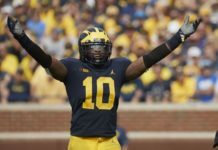 Gary has the potential to be the best player in the draft class, and certainly the most physically gifted, as the 6’5″, 282-pound man has been rumored to run the 40-yard dash in under 4.6 seconds. With the draft’s deep pool of defensive tackles though, the Broncos would be smart to address one of their more pressing needs in the first round before finding a defensive tackle later on. Clemson’s Dexter Lawrence could be a great option, as he could drop following a failed drug test. Fellow Clemson Tiger Christian Wilkins and Notre Dame’s Jerry Tillery would also make a lot of sense for the Broncos on Day 2. Lawrence and Tillery are possibly the two best run stuffers in the draft, but Wilkins would offer more to the pass rush. The Broncos should make it their top priority to re-sign Shelby Harris. He seems to be getting better exponentially and should replace Derek Wolfe sooner rather than later. It would be incredibly painful for the Broncos to let Harris walk, only for him to become a star elsewhere. Kerr has been disappointing for the most part, and should be allowed to test free agency. Ideally, Peko would be willing to come back on a one-year deal worth around $3 million. But if he chooses to retire or search for greener pastures, Kerr should be retained so the Broncos aren’t left without a defensive tackle. Then, Denver should enter the draft looking for a defensive tackle and some value. 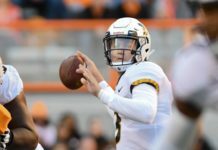 The Broncos shouldn’t take a quarterback this year, although they likely will, so even taking a defensive tackle like Houston’s Ed Oliver or Rashan Gary with the tenth pick would be smart if they were to fall. Barring one of those elite defensive tackle prospects falling though, the Broncos should hold off on addressing defensive tackle until the third or fourth round unless some excellent value presents itself. In a perfect world, this would allow the Broncos to keep their rising star in Harris as well as Peko as an important voice in the locker room while adding some talented youth behind him.